Leather is so tactile in ones hands, so luxurious. Wearing it can be tricky, generally too much leather and lack of textured accessories will look out of place in most settings. 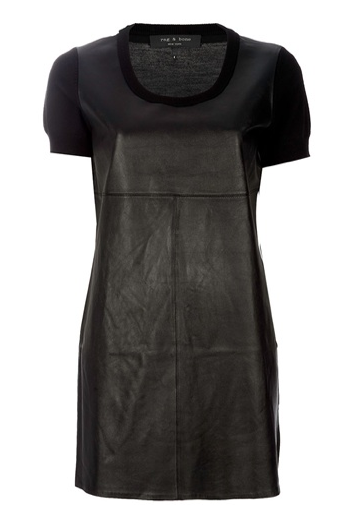 I fell in love with the Rag & Bone Ashfield Dress many weeks ago and have stared at it longingly as it held pride of place in my ShopBop.com "Hearts List". This dress has comfort, fit and style. The leather is on the front. The neckline, sleeves and back are a good quality knit. This works as there isn't black leather against skin on the upper body which can create a sallow look in the Winter weather, especially at the neck. The fit and style are also great, the knit on the back and sleeves not only makes this a comfortable dress, but it looks good when you are sitting down. 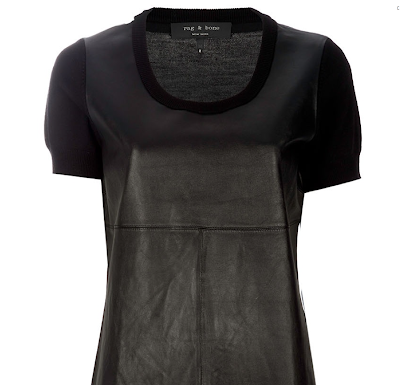 The balanced mix of sumptuous soft leather and soft knit make this a perfect day dress, with a great scarf and some suede short boots. My Ashfield Dress is from BlackWhiteDenim.com. It was £650. Now £192. Fashion Blog: Marni at H&M on the 8th March. Fashion Blog: Reliable, Stylish Zara. Fashion Blog : High Street Luxe Find : Vegan Leather Chloe-Esque Shoes, Flattering Ballet Flats And More. High Street Luxe Find: H&M Leather Cross Body Bag and Belt. Aspen Mountain, the most beautiful place with real Christmas trees glistening with snow. Thai 'M" Out Treatment @ The Captain's Club Spa.